Daniyal Khan (Saif Ali Khan) an army officer is appointed to kill the Pakistani terrorists who were involved in the horrific 26/11 attacks on Mumbai. In the process he meets, Nawaz Mistry (Katrina Kaif), a former RAW agent who now works as a security counselor and also supplies arms to refugee camps. She assists Daniyal on his mission to kill the terrorists. How Nawaz did helped Daniyal and what are the situations Daniyal faced, in the process of killing the terrorists, forms the rest of the story. The movie opens with the real footage of 26/11 Mumbai attacks. Later it picks up to the officials who take the issue seriously in 2015 and catch hold of the terrorists. During this process, in what situations, Saif Ali Khan comes into picture and how did he find a breakeven point, in hunting the terrorists, forms the first half of the film. Coming to the second half, Saif action scenes in Syria and Pakistan and the narration scenes are good, but the climax appears bit dramatic and also stretched. The scene seems lagged more than required. If it is trimmed, then the quality would have been better. Otherwise, the entire second half is decent. Saif Ali Khan as an army officer gave a stupendous performance. It would literally be a feast to Saif fans who are waiting to see him getting back with a bang. But Katrina Kaif might not attract her fans or the normal movie lovers this time. Be it with her performance or dialogues, she disappoints this time. The background music by Pritham Chakraborthy is another major strength of the film. The music elevates the scenes and makes it more ferocious. The production values are good enough, editing needs bit care, as a few of the unimportant scenes are dragged unnecessarily in the film. Kabir Khan needs a loud shout for his brilliant directional skills. After Bajrangi Bhaijaan, he has again given his best. In a few of the scenes, he gives the goose bumps to the audience, with the way he narrated the story. He perfectly captured the feelings of the Indians regarding 26/11 attacks, and portrayed them well on the screen. 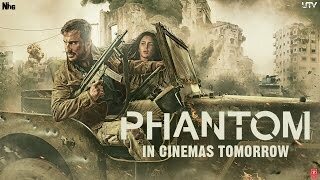 Phantom is a sure watchable movie for the audience, who loves the strong weight concepts like 26/11 attacks. Kabir narration skills make the audience comes to the theatre repeatedly.